This week has been amazing! I finally received my Hollywood Treatment back and I’m so excited! For those that don’t know what this is, it is a report created by a screenwriter enlisted by my publishers. It’s basically a pitch that involves a brief synopsis, log/hook line and a detailed description of what would be included in a TV/Movie adaption of your book. In my case, the screenwriter wrote thirteen glorious pages of a one-hour pilot TV episode! It’s absolutely incredible and even as I read it, I’m watching the episode play out in my head! I get butterflies in my stomach! Where it goes from here is to two different Hollywood companies for possible production. If neither of these companies are interested, it gets put into a database as “available material” to other producers, screenwriters and directors to view and possibly take on. As as author, it is one of my main goals to transform the Enchantment Series into a movie saga or TV series. I myself love delving into living stories and to see my own books come to life, well, I get emotional just thinking about it. 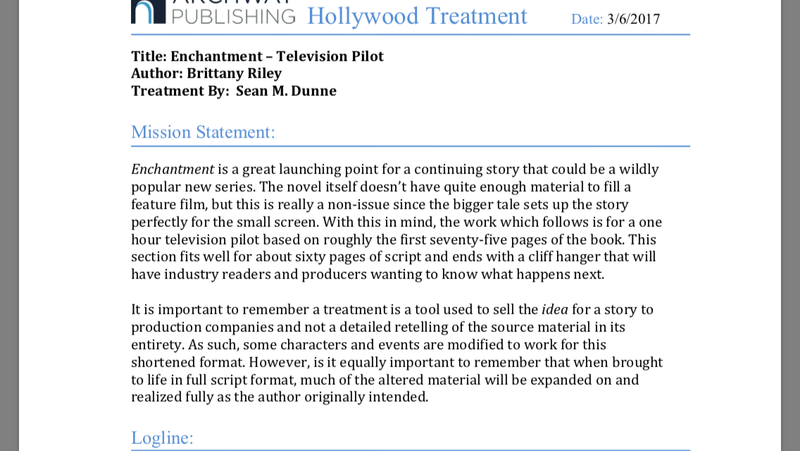 The company I published my book through offers what is called a ‘Hollywood Treatment,’ whereby the manuscript is taken by a special industry professional who then produces a 5-10 page report on how the book would be transformed into a movie/TV series. And better yet, this report is then submitted to both Paulist Productions and Thruline Entertainment for possible production. If neither of these companies are interested in taking it further, the report will be put in a database for Hollywood writers, producers and directors to research and develop if desired. I seized the opportunity to participate in this and I’m waiting on the initial report to come back as we speak! It may be a while before anything comes of this, and I know I still have a long journey ahead with agents, contracts and scripts, but I don’t just see a film/TV adaption as a possibility, I see it as a certainty. So much so, that I already have a list of actors that I think would suit my characters! Watch this space for updates on my progress!